Mark your calendars folks, the full Spring Training schedule has been announced. 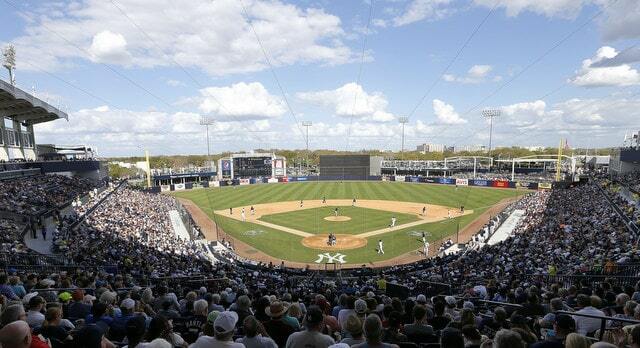 Earlier today the Yanks announced pitchers and catchers will report to Tampa to begin the 2019 season on Wednesday, February 13th. That is 68 days away. Seems so close and yet so far, doesn’t it? Wednesday, February 13th: Pitchers and catchers report. Monday, February 18th: Position players report. Tuesday, February 19th: First full squad workout. Saturday, February 23th: Grapefruit League opener at Red Sox. Monday, February 25th: Grapefruit League home opener vs. Blue Jays. Monday, March 25th: Exhibition schedule finale at Nationals Park. Thursday, March 28th: Opening Day vs. Orioles. Wow, gonna be weird for Bryce Harper to make his return to Nationals Park during one of those token end-of-spring exhibition games, huh? I kid, I kid. But also the Yankees should totally sign Bryce Harper. Would be cool. Anyway, the Yankees have 31 Grapefruit League games plus the one exhibition game in Washington on the spring schedule next year. Here is the full spring schedule. Spring Training tickets are not yet on sale. Spring season tickets should be on sale soon and individual tickets usually don’t go up for sale until January. The various television networks will announce their Spring Training broadcast schedules in late January or early February. I’ll pass along that info as it’s released.